Chef Mike Pietrafeso at Roost in Darien Monday. DARIEN — Roost has officially opened its doors on 1950 Post Road to hungry customers. 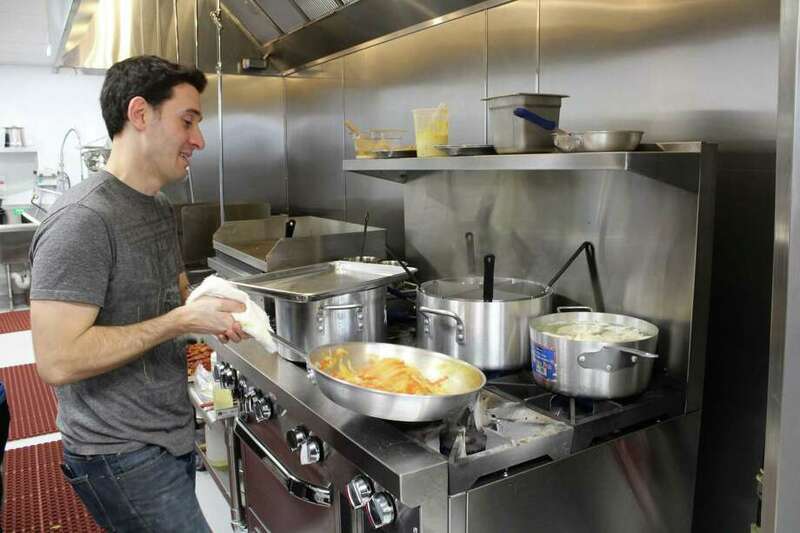 Mike Pietrafeso, the 36-year-old chef who graduated from the French Culinary Institute in 2006, tested out the system on Sunday, a day before the opening, and was assured everything would run smoothly. “Turnout has been good. We’re expecting people to check us out throughout the day,” Mike Pietrafeso said on Monday as he was busy attending to guests and the kitchen. His wife, Krista, showed up later that day with balloons for the special occasion. The eatery, which features seasonal dishes made with locally grown ingredients, is the Pietrafesos’ second restaurant. Ada’s Kitchen + Coffee in Greenwich is their first. Like Ada’s Kitchen, Roost also features ingredients from local groups, like Path Coffee Roasters in Port Chester, N.Y. and Arogya Teas in Westport. Similarly, a large chalkboard on the back wall displays the food and drinks options that range from an assortment of sandwiches to a combination of smoothie flavors. Nathalia Correa works behind the counter at Roost. She started out a month ago at Ada’s Kitchen and is now working in Darien. “It’s exciting to see new faces and we might even see familiar faces coming from Greenwich here,” Correa said. Roost is open from 7 a.m. to 8 p.m., a time frame Mike Pietrafeso hopes attracts both commuters and residents. Darien residents who came in the morning hours shared their enthusiasm for the new locale. Amy Weinstein, who moved to the area in September, was in line to get coffee along with her friend, Beth Burger. “It’s great to move to a place like this and have this coffee shop nearby,” Weinstein said. “We needed to have a coffee place in the area,” Burger added. Some early risers appreciated the proximity of the restaurant to their neighborhoods. Alyssa Ferenz, twin sister of Krista Pietrafeso, showed up around 10 a.m. to Roost.